In the last couple of blogs in our pediatric series looking at the TiLite Pilot, we went over some common limitations of pediatric manual wheelchair design as well as understanding how children gain independent mobility. 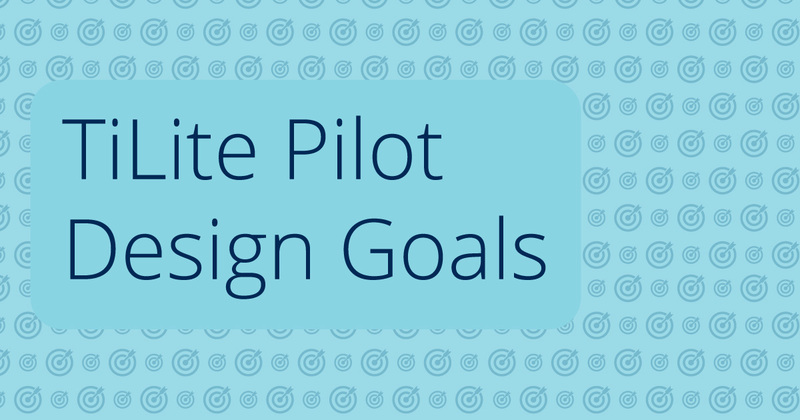 In this blog, we’re going to talk about the goals we had in mind while creating the TiLite Pilot. Let’s start with the video of Wyatt and the TiLite Pilot. Hopefully this video provided a little insight of what Wyatt is able to experience in his TiLite Pilot. Now we want to take a more detailed look at some of the goals we wanted to achieve by creating this product and how Wyatt embodies these concepts. The design needed to fit the child in their current measurements, while still allowing for growth. It needed to have a seat to floor heigh specific for a child's world, and it had to grow in a forward direction to match the growth of the child and maximize the way he was able to push and maneuver his wheelchair. As we can see, Wyatt was able to explore his environment, continue to develop and learn through movement, and experience improved push technique by providing excellent rear wheel access. The TiLite Pilot needs to fit the child as snug as possible with the understanding that a child may grow rapidly, depending on the time that this wheeled mobility intervention is provided. The chair fit should not be tight and should have 4" of width to allow for growth into the wheelchair. The TiLite Pilot allows a balance between fit and adjustments for growth without sacrificing push dynamics, potential for postural impairments, and limiting the need for a brand new chair every 6 months to a year. The seat depth and frame depth of the TiLite Pilot can be changed without parts, since children tend to grow in height and leg length at a faster rate than width. The seat-to-floor height of a pediatric manual mobility product needs careful consideration. We want the child using the manual wheelchair to have appropriate access to rear wheels. Seat-to-floor height may be somewhat of a compromise when working with the pediatric population as parents or team members may want the child to sit very tall off of the ground to be able to reach and access table tops and work surfaces or perhaps just to ease with dependent transfers. This must be balanced with making sure the child has better wheel access and the wheels are appropriate for the size of the wheelchair frame. When considering seat to floor height in this young patient population, think about positioning the child in the chair not on top of the chair. By encouraging the use of camber, turning becomes nice, easy, and efficient for the child that is self-propelling. The addition of chamber also brings the wheels a little bit closer to the child. By increasing rear wheel access from the beginning, there is no waiting until the child is bigger to have efficient push technique. In addition, at the narrow width that pediatric manual wheelchairs are available in, 8" wide fo example with the TiLite Pilot, camber also helps to increase stability of the wheelchair when a child reaches to the side for reaching or other functional activities. At this small of a chair width, the benefit of camber for ease of turning and maneuverability outweigh any increase in overall chair width. With a composite molded solid seat pan and integrated side panels, the growth needed for seat depth and adjustments to seat to floor height can occur quickly should the child have rapidly changing needs. These integrated side panels also reduce the overall weight of the chair while still including adjustability. Seat width can be accommodated with additional components, which can be ordered at the time the chair is ordered or at a later date. The integrated side panels and the fact that the side frames grows with the child, we are able to accommodate forward growth while maintaining excelled rear wheel access without added weight. Another plus of adjusting seat to floor height from the side panels: no need to align the front casters! The TiLite Pilot features a stable wheelbase, as seen in the distance from the center of the rear axle to the front caster. This allows the child to lean as far forward as they want to on the chair as well as transfer up the front of the chair without feeling like the chair is going to tip forward. Last but not least, make it fun. By having options to make the chair fun and inviting, we’re allowing kids to make selections that encourage them to want to be in this chair. Our kid-friendly color selections include red and blue for all your superheroes or neon pink and ultraviolet for all your princesses. The TiLite Pilot comes in a boy’s theme, a girl’s theme, a gender-neutral theme or create a combination of components that works best for your child. The anodized components are no additional charge, so you don’t have to worry about having that conversation. There are a variety of very colorful but well thought out options and accessories available to choose from including light up front casters, colorful mag wheels, high performing Spinergy wheels in a variety of colors. Looking back at the video with Wyatt we can see a few of these goals in action. By unweighting the casters, Wyatt can now turn the chair very efficiently. His center of mass is very, very close to being over that rear wheel making that push as efficient as possible. The integrated side panels allow for growth while reducing the overall weight of the chair, and the weight reduction helps ease parent transportation as they life and load the chair. Marr, C., Seasman, A., & Bishop, N. (2017). Managing the patient with osteogenesis imperfecta: a multidisciplinary approach. Journal of multidisciplinary healthcare, 10, 145. Sawatzky, B. J., Slobogean, G. P., Reilly, C. W., Chambers, C. T., & Hol, A. T. (2005). Prevalence of shoulder pain in adult-versus childhood-onset wheelchair users: a pilot study. Journal of rehabilitation research and development, 42(3), 1. Slavens, B. A., Schnorenberg, A. J., Aurit, C. M., Graf, A., Krzak, J. J., Reiners, K., ... & Harris, G. F. (2015). Evaluation of pediatric manual wheelchair mobility using advanced biomechanical methods. BioMed research international, 2015. Jennith Bernstein received her masters in Physical Therapy at North Georgia College & State University and returned to complete her transitional DPT at University of Texas Medical Branch in 2014. While at Shepherd Center, Jennith, initiated a “Seating Champion” program to improve the inpatient and day program clinicians understanding of complex seating, pressure management and skin protection as well as research reviews, advanced programming and adjustments. She was also part of a center wide multidisciplinary focus group for reduction of hospital acquired skin breakdown. Jennith has served as a volunteer teacher at the Universidad Mariano Galvez in Guatemala, instructing spinal cord injury curriculum as well as seating and mobility. Jennith has presented at national conferences such as RESNA, ISS, and the APTA NEXT conference. Jennith has been a practicing PT for 12 years and spent the last 10 years at a model SCI center (Shepherd Center) in Atlanta, Georgia. Jennith joined Permobil as the Clinical Education Manager for the Central Region in 2016.